Freetown: A pastor working in the mines of eastern Sierra Leone has unearthed a 706-carat diamond, a discovery that experts said on Thursday could be the 10th largest stone ever found. The huge rock was extracted by Emmanuel Momoh, one of thousands who seek their fortunes in the informal mining sector that dominates the diamond-rich Kono region. As a self-employed miner with a valid government permit, Momoh is entitled to the proceeds of any future sale, except four percent the government takes for valuation and export, according to the law, plus an undetermined level of income tax. Mines Minister Minkailu Mansaray said the government’s stake would be used to fund development projects nationwide. The diamond was presented to President Ernest Bai Koroma on Wednesday before being locked in Freetown’s central bank vault. It awaits an official valuation under the Kimberley Process, which certifies diamonds as “conflict-free”. 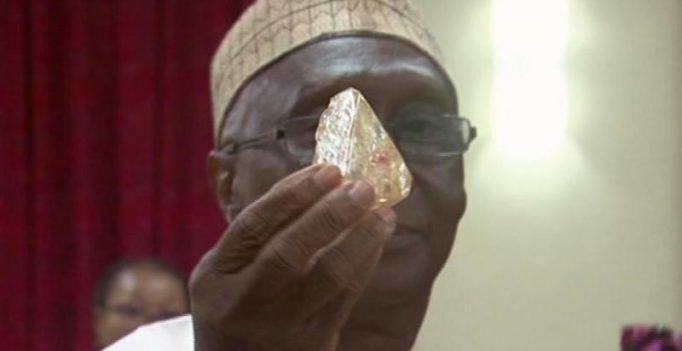 It will then be sold in Sierra Leone under a transparent bidding process, a government statement said, thanking the chief of the Tankoro area where the stone was found for not smuggling it out of the country. The government has attempted to crack down on cross-border diamond trafficking to persuade foreign investors that the “blood diamonds” that fuelled its civil war are a thing of the past. Such a find by a so-called artisanal miner, the term for workers who use basic tools or their bare hands to sift the earth, is highly unusual. “Most recent exceptional diamond discoveries have been made by large commercial miners that mine very large volumes of kimberlite ore and process it with advanced equipment,” Zimnisky said. “Artisanal mining tends to produce smaller, lower quality diamonds because of breakage and erosion,” he added. Zimnisky said the stone would likely be sold outside Sierra Leone, despite the government’s assertion, on account of better access to buyers. Without a professional assessment of the diamond’s potential flaws and colouring it is impossible to value the stone. However, a polished stone cut from the Jonker, which is the 10th largest gem-diamond ever recovered until now at 726 carats, will go on sale in Hong Kong in May. A single 25-carat portion is likely to sell for $2.2 million to $3.6 million (2 million to 3.4 million euros), or $88,000 to $144,000 for a single carat, Zimnisky said. A 1,111-carat diamond was discovered at a mine in Botswana in 2015, the biggest find for more than a century. That gem is second in size only to the Cullinan diamond which was unearthed in South Africa in 1905, at 3,106 carats uncut, according to the Cape Town Diamond Museum. The Cullinan was cut into several gems, including two set into the sceptre and crown of the British Crown Jewels. Sierra Leone’s role in the diamond industry has long been controversial, and Freetown residents are already sceptical they will see any gain from the sale. “Previous diamonds have not benefited the people and I wonder how this new diamond will make a difference,” said Jeneba Kallon, a civil servant. Another city resident, Mohamed Kamara, said Sierra Leone’s diamonds were “more of a curse than a blessing”, citing the high rate of poverty and underdevelopment where the minerals are found. The sale of “blood diamonds” helped finance civil wars across Africa in the 1990s and often funded military dictatorships on a continent that the London Diamond Bourse estimates provides 65 per cent of the world’s supply. Sierra Leonean rebels allowed traders to exploit diamond mines and ship the gems abroad via Liberia during the 1991-2002 civil conflict. Former Liberian warlord Charles Taylor was found guilty of supporting the rebels in exchange for diamonds mined by slave labour. The death toll from Sierra Leone’s civil war is estimated at 120,000 in a country that now has roughly six million people, making it one of Africa’s deadliest conflicts in recent history.